Onrush is pretty much one of those games that doesn’t try to be pretentious and already states all you can expect in its title. Onrush is about, well, the onrush of drivers that put themselves in life threatening conditions in order to race in a team based composition, where it’s not about getting the first place, but rather about performing tricks, preventing your opponents to achieve their goals, wrecking cars and of course stealing the glory. At first sight we were treated to a game that has a lot in common with Motorstorm, but also a few hints of Burnout, which made us curious to see how the need for speed would truly add up in this fairly unknown racing title. Onrush doesn’t have a titular story to be watched in awe, but you’ll get some background about a few drivers wanting to beat the odds in ridiculous conditions, which provides a fun frame for the game. As you progress, you’ll learn that what you’re doing does get a following, but other than that, there isn’t really that much story content to explore. You’ll have to make do with a fun arcade racing game, that just wants to have a small background for why you’re actually racing. Onrush certainly looks a lot like Motorstorm in terms of environments, the rugged vehicle options and the overall blur you get while racing. The game looks more than good enough to be entertaining, but it never truly touches the potential of the PlayStation 4, compared to other racing games that find themselves in the simulation genre. Nonetheless, because of the constant speedy nature of the game, you’ll hardly have time to pay attention to the details, which means that the game certainly still looks great in its genre. The cars look a bit bland and boring at the start of the game, but the further you progress, more decals will become available that will spice up the otherwise bleak designs. The soundtrack of Onrush is one of the best soundtracks for a racing game for this and perhaps even the previous generation. Back in the days of Need For Speed: Underground, the soundtracks of racing games were often bombastic, explosive and so goddamn likeable because it got the adrenaline flowing, it gave you the sensation of speed and you were almost glued to the screen because you were so excited. More and more, racing games are choosing bland and boring music over actual well-known tracks or simply somewhat more fiery songs, and we simply don’t know why. Onrush hits all the right snares and even when leaving the game in standby, you’ll have more than enough music to entertain you when you decide to do something else in the same room as your console and speakers. The voice acting from the announcer is okay-ish, but it never comes close to the stellar quality of the music. 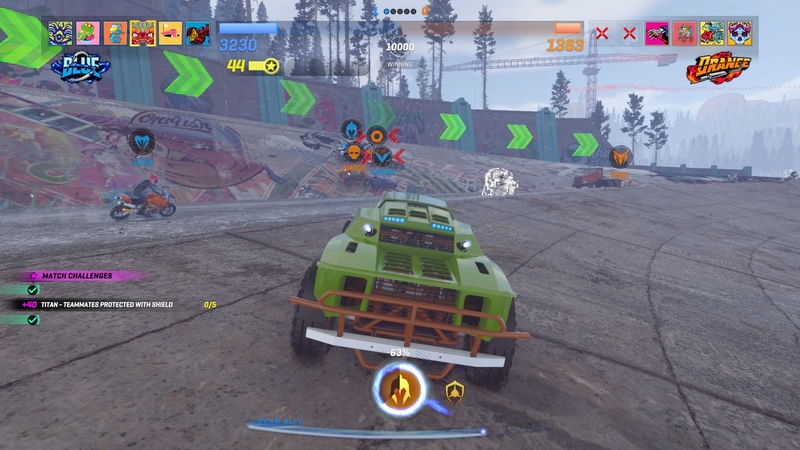 Onrush is a team based racing game, where the goal is to obstruct your opponent as much as possible in several different modes. 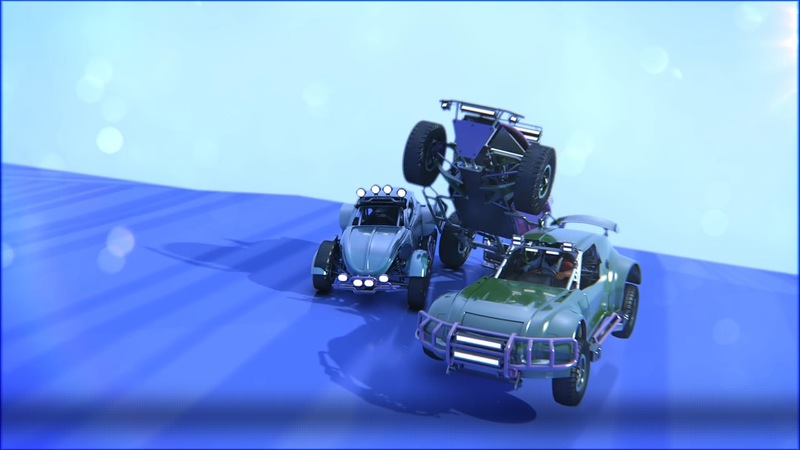 You’ll have to make do with a handful of different vehicles, each with their own special abilities, in order to create a balanced team and take home the gold. Overall things remain simple and easy to pick up, but the game is no walk in the park when playing against other players. The game is pretty straightforward as you’ll always have to reach certain goals as a team. 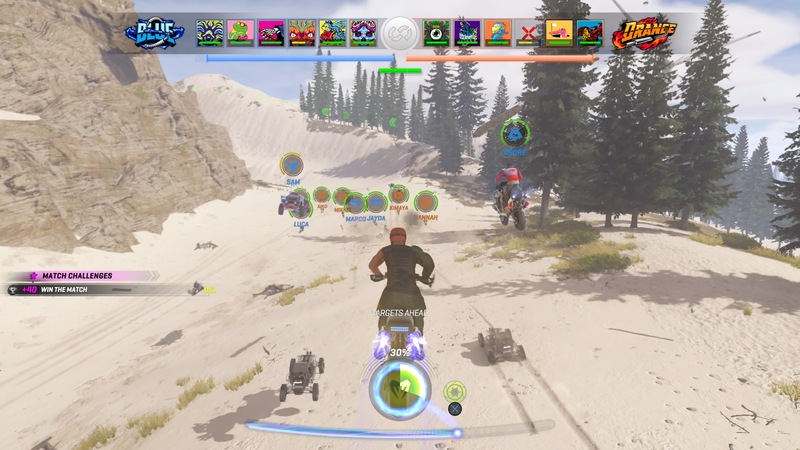 Unlike other racing games it’s not about leading the pack, but it’s about gaining and using boosts after performing takedowns, airtime and so on. 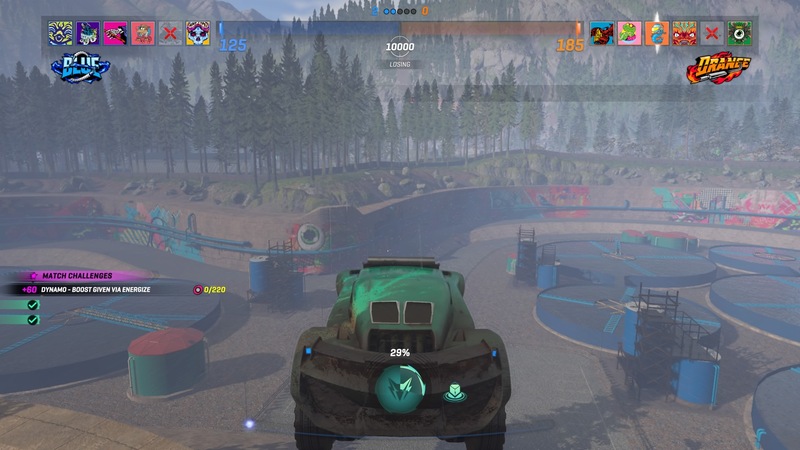 Other modes revolve around racing through gates and trying to hinder your opponents from doing the same, or you can opt for the mode where you knock out your opponents as much as you can, so they don’t have any vehicle switches left. Last but not least there is a mode in which you have to try and claim a zone that’s constantly moving. This can only be claimed by the team that has the most cars in it for several seconds. Overall the game’s biggest issue might just be the lack of single player content. The single player mode only features about twenty races, which feel like a tutorial for the online races. Sadly, playing against other players makes the game a lot harder, and you can’t even play with a friend in local co-op, or play online with two players on one console. That being said, the game is a blast to play online, and the more you play, the more experience you’ll get and the more gear you’ll unlock to pimp your character and rides. The controls are truly one of an arcade game, where handling is only a detail, speed is unrealistic and you only need to press the gas button, the boost button and use your ability when your meter is full. The game is easy to play and doesn’t pester you with too many controls or difficulties, allowing you to jump in the saddle and enjoy the extremely bumpy and explosive ride. Onrush certainly packs a proper punch and is very enjoyable, even with the lack of content and the seemingly forced online play. The game is a fun homage to Motorstorm as well as Burnout, all accompanied by a superb soundtrack and a fun class based vehicle system. 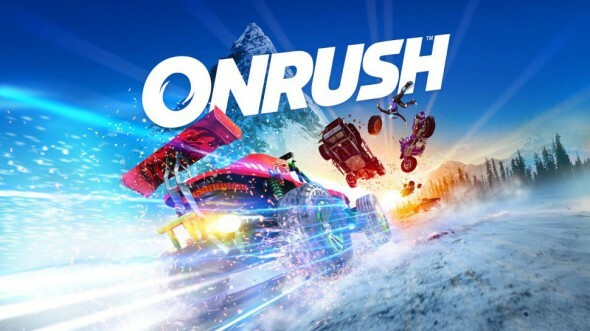 If you’re looking for something more along the lines of old arcade classics, with fairly easy pick-up-and-play mechanics, we can only suggest to check out Onrush. If you’re looking for a race title with loads of cars and a lot of content, then you’re better off choosing other titles.